On Monday, I started Best Body Bootcamp by Best Body Fitness. I started it because I wanted a bit of a competition – to challenge myself – and to see if this kind of format would work for me. It’s an 8-week program. Every 2 weeks, we get a series of workouts for those 2 weeks. The workouts include straight cardio, strength, core, and combination strength & cardio. Tina provides the workouts for 5 of the 7 days, but if you are following a running program or have a class/program you are already doing, you can substitute the workouts as needed. The goal is to be active at least 5 of 7 days. Also, each member sets 2 goals for the week. They can be nutrition (eat more veggies, drink 8 cups of water, etc. ), physical (walk a mile each day, etc. ), or motivational (journaling each day, etc.). Tina awards points for the categories – points for exercise, points for goals, and points for blogging/sharing your experience. She will award prizes throughout the program to those who consistently participate. Monday – I completed the planned workout (strength), finished week 4 of C25k, and completed both goals. Tuesday – Instead of completing the planned workout (cardio), I started week 5 of C24k, and completed both goals. Wednesday – Instead of completing the planned workout (core – I tried it and it was HARD! ), I lifted weights with my friend Tracy for an hour. I only completed 1 of the goals. Thursday – I only finished 1 of the goals. Friday – I completed the planned workout (strength), C25k run, and both goals. Saturday – I only finished 1 of the goals. Sunday – I only finished 1 of the goals. I didn’t do everything I wanted, but that’s ok. Part of my struggles were timing. My goals for the week were to drink 8 cups of water each day and to spend 5 minutes free-writing (as part of January’s BestFoot challenge). Weekends are hard for me to always get enough water. They are also hard for me to schedule workouts depending on Hubby’s schedule. However, for the most part, I did ok, except Thursday when I really didn’t feel all that well. Next week is a new week and I’m looking forward to pushing myself a little bit more. Plus, I have 2 new apps to try – Runtastic and Sworkit. My workout schedule is going to be a little wacky due to some things I have going on, but I will do what I can. I am keeping the same 2 goals just to keep them in the front of my mind. Additionally, I started the local Y’s team weight loss competition. My team seems pretty motivated. The competition has 8 challenges and 2 weigh-ins. The winning team will win cash, and there are also cash prizes for biggest losing man and woman. I also started my employer’s BMI challenge. For that challenge, we have to reduce our BMI by 5% in 12 weeks. If we succeed, we stay in the challenge for another 12 weeks. If we maintain or reduce further at the 24-week weigh-in, we can stay in the challenge for another 12 weeks. At the 36-week weigh-in, if we have maintained or reduced further, we can stay in the challenge until the end. Overall, if you stay with it, you can earn over $300. Here’s looking forward to some great challenges! 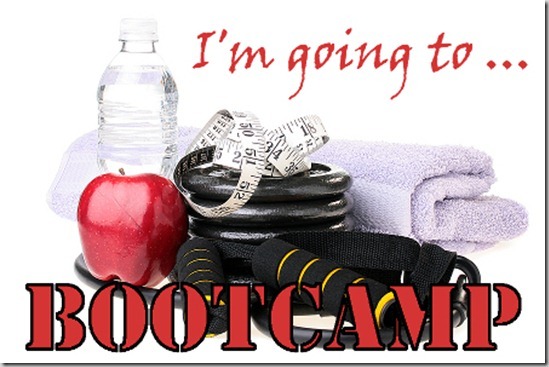 Good luck with bootcamp, the Y challenge, and the BMI challenge! Thanks! I try not to bite off more than I can chew, but if I can keep up with these, then I can maybe earn/win some good money (which will help pay for races, right? )!